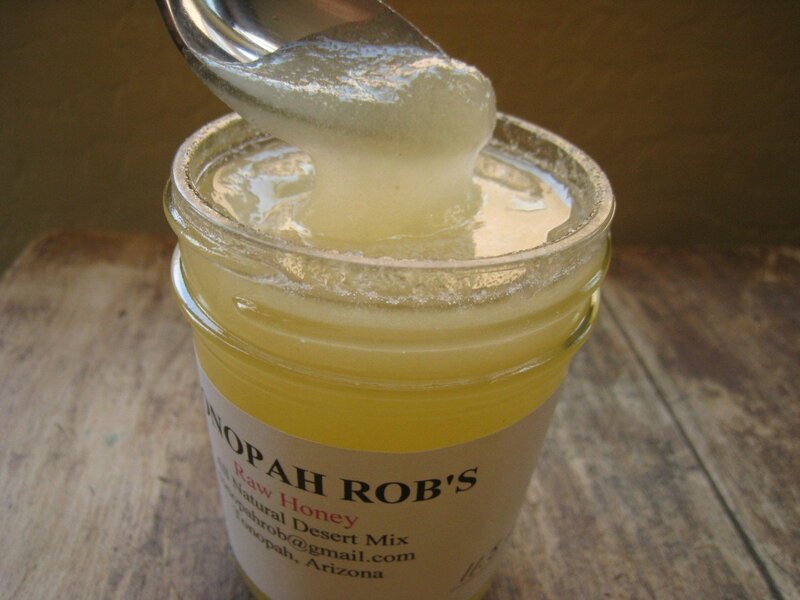 Herbal raw honey ointment…nothing is as powerful to encourage skin healing like raw honey! Combined with medicinal herbs and bursting with antibacterial and antiseptic properties, this ointment is a must-have in everyone’s first aid kit. Just wait until you try it! One use is all you need in order to see its’ amazing effects…you won’t want to be without it. The beauty of making our own medicinal salves at home is the ability we possess to control the ingredients. I will share with you my recipe, but as always…feel free to let your creativity and wisdom regarding medicinal herbs guide you. Olive oil. Full of vitamins A, D, E and K, olive oil nourishes the skin for fast healing. Comfrey. Encourages the reproduction of cells therefore working to support the mending of sprains, bruises, swellings, burns and sores. Marshmallow root. A wonderful anti-inflammatory herb that will also soften and soothe the skin. Likewise, it’s great for burn and wound healing as it contains large amounts of zinc and vitamin A.
Wormwood. Reduces the effects of soreness and pain. Witch hazel bark. It’s anti-inflammatory and astringent properties are excellent for treatment of blisters, burns, cuts and wounds. Raw, all-natural honey. 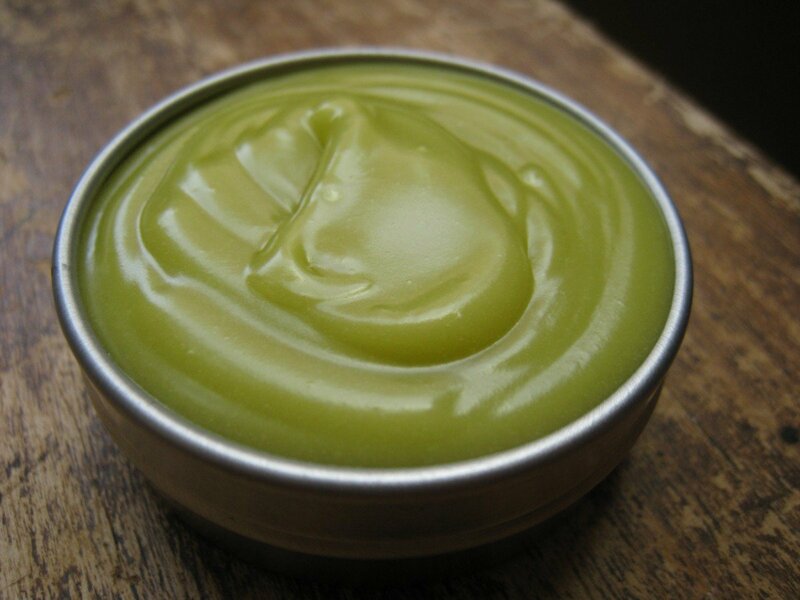 Raw honey provides the base of this ointment and is a well-known antibacterial agent. Honey is also highly nourishing, often reducing the risk for infection and scarring. *All measurements are by weight and use of a simple kitchen scale. 1. Weigh the dried herbs using a kitchen scale. Cold Infusion.In a glass mason jar, cover the weighed herbs with 1 ¼ cup of oil. Stir to combine, and allow oil and herb mixture to steep for 4-6 weeks. 3. Strain the oil and herb infusion through a cheesecloth. Squeezing to extract as much oil as possible. Be sure you collect at least 1 cup of herb infused oil. 5. Allow salve to cool on the counter. As it hardens, begin to stir with an electric stick blender until creamy and smooth. 6. Continue to stir with stick blender until salve is cooled to approximately 90-100 degrees fahrenheit. Then add raw honey. Blend well. 7. Pour ointment into storage containers — click here to purchase new tins or jars…otherwise a good ole mason jar works just fine! Will keep for a year when stored in a cool, dark place. To use: Apply directly to a clean burn, blister, or wound and bandage as you normally would. Note: I purchased the dried herbs for this ointment from Mountain Rose Herbs and/or the Bulk Herb Store. Find beeswax here. 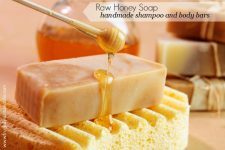 Raw honey can be found online through the Bulk Herb Store or use this website to search for it locally. 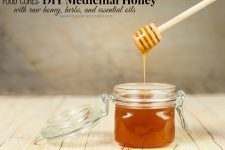 Do you use raw honey for wound healing? Tell us about it! Hi Cynthia! Great question! My only concern with the extracts would be the medium. If they are tinctures in an alcohol base the salve may burn when applied. For this particular ointment the plant material steeped in oil may be your best bet. I really like the way you think though…excellent idea! How do you clean the stick blender? I’ve tried a few lotions & balms at home. Cleaning up was a nightmare, but I’d like to master these homemade things! I’d try cutting it on in a bowl of really hot soapy water. Especially Dawn soap, love that stuff. Would this ointment also be appropriate for diaper rash? The trick is to make sure you buy a stick blender with a removeable stainless steel blending shaft. It’s easy to toss the shaft attachment into very hot or boiling water which melts the bees wax and oily goo off. I bought a great stick blender with a stainless steel shaft at Amazon for under $30. Awesome stuff for diaper rash! GREAT idea! May be a dumb question but with regard to using on a baby for diaper rash, is it ok since there’s raw honey and beeswax? I’ve always heard no honey for babies…granted they aren’t consuming it but in effect, they are through their skin. There haven’t really been studies in this area. The concern with babies eating honey or honey products is mainly the risk of botulism, a life-threatening, frequently fatal condition arising from the ingestion of botulinum toxin (botox). It would seem that putting honey on a normal baby’s skin would be fine, but just based on this I would not use it on broken skin (eczema, for example). Is comfrey necessary for the formula to work well? Our health care store was out, hoping I can use calendula in stead. Also, they only carried witch hazel leaf, not bark. We looked them up at the store and it looked as if both plants were used for the same purposes, so I picked up a bag of the leafs. Other than that, I have all the ingredients and am excited to start soaking my herbs. Hi Carrie! Comfrey is such an excellent herb for burns especially, but the real powerhouse here is the raw honey. I think calendula would be an excellent addition/substitution if that’s what you have on hand. And the witch hazel leaf is perfect to use also…I’d say soak away 🙂 Let me know how it turns out for you!!! I love a good burn salve. I’m still using up a tin of Eden Salve from Shoshanna at Bulk Herb Store, mostly because I use fresh plantain as my first defense, along with ice for cooling. First I gently glide ice over the burn, then I lay freshly chewed plantain leaf on it. (You could crush it with a mortar and pestle too but when outdoors, chewing is the fastest way to get the plantain on and working!) You can then continue to cool it with ice over the top of the plantain. Then when completely cooled, apply salve/ointment. It is worth noting that the burn should always be cooled before putting ANY oily substance on as it can cause retention of heat and therefore longer time before pain diminishes and healing begins. However, if you have no ice or cold water available, plantain leaves can be used directly. Put a bag of fresh plantain leaves in the freezer for use when fresh is unavailable… which is a long stretch of months here in Alaska. One of the things I love most about plantain is that it grows virtually everywhere. Excellent for mosquito bites and bee stings too. Excellent recommendations here Beth! Thank you SO much for sharing…plantain is amazing stuff isn’t it. I am a beekeeper and have the raw honey and beeswax but not the herbs…. I will share this with other beekeepers. Thank you for the recipe. Looks like a winter project for me. As an ER vet I will inform you that a “hot spot” in dogs is a combination effect of- deep pyoderma (infection), allergies and self mutilation from pain and infection. Often times these wounds need to be treated from the inside as well as out. I would be hesitant to use “ointment” on deep, weeping wounds like hot spots because it can potentially seal in infection (there are lots of bacteria that thrive in anaerobic conditions). This ointment sounds great for superficial wounds/abrasions, but I’m not sure of its efficacy for deep pyoderma. Any thoughts from formally trained herbalists? By the time I see most hotspots the dogs are in too much pain and the infection is very deep- so I do need to start them on oral antibiotics as well as antihistamines and low doses of steroids, while I clean the wound. If you are hesitant with antibiotics and steroids (and, remember, everything has a place and time to be used), I’ve treated many superficial hot-spots with Vetericyn spray, works very similarly to witch hazel, but has been formulated specifically for cats, dogs and horses. As always, please consult with your veterinarian before starting treatment at home. Remember, your pets can’t speak up for themselves if treatment isn’t working well. Also, if it’s in a location where they can chew at it, I’m sure you don’t want them ingesting this ointment as well. *blech*. Many of these topical rely on what is called “contact time” for effectiveness. (Though I’m sure the honey tastes delicious, the rest of the ingredients…. not so much, hahahah). A somewhat unrelated question I had… I’ve noticed that you have mentioned using pine tar before. Can you tell me where you get it. I was hoping mountain rose herbs would have it but they don’t. bummer. 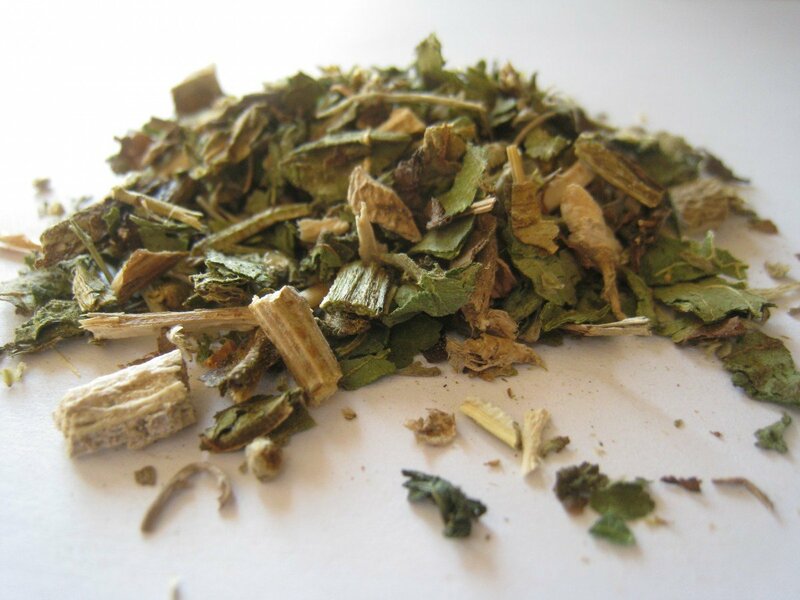 Did you use comfrey leaf or comfrey root? Thanks! Can’t wait to make this!! Oh the leaf! Thank you Aldana! I’ll update the post. The leaf is less toxic than the root for sure. Thanks Andrea! One more question: how much does this recipe make? We have always just had customers use raw honey directly, but looks like we need to add in the other ingredients for the extra benefits! Thanks. Honey is one of those amazing things nature produces. I’m always a fan of homemade medicinal remedies, just for the reason you mentioned; you get to regulate what you put in it. Good question, Merry; hope B Kitchens sees this. raw honey is great stuff btw and manuka honey is the best for its medicinal properties! This looks like a great salve to make and have on hand. Raw honey is also a preservative so it should have a good, long shelf life. I recently started using a mix of raw, organic honey and ex virgin olive oil to clean my face and the results have been phenomenal!! I had noticed that after a long illness and depression that my complexion (I had always been told I looked much younger) was looking so much more aged. I panicked and decided to scrap the beauty products I had always bought and went natural. My skin is sooo soft, the pores have shrunken and the sag is nowhere near what it was. I tried your suggestion of olive oil and honey as a cleanser….Love it…. I have infused olive oil with Lavander and Calendula to make my own lip balm. I will be using this wonderful oil with the honey as a cleanser. Thanks for your suggestion. I have very sensitive skin. I have been diagnosed with perioral dermatitis and or Rosacea and struggle with breakouts. I am currently on a topical antibiotic as well as oral antibiotics, so I am always looking for natural alternatives. Thanks again. To clean your stick blender (or any beeswax mess) use heat, a hair dryer and paper towels will work wonders. I don’t own an emersion blender but I have a ninja pulse food processor with a blender attachment would that work?? Thanks for your help and I love your website. I am an RN and I love learning about some of your herbal remedies that you have. Wonderful website that was recommended to me by the owner of our local nursery a few weeks ago while I was buying organic herbs as mine were not growing fast enough! It’s been pretty chilly at night this summer, low 40’s. 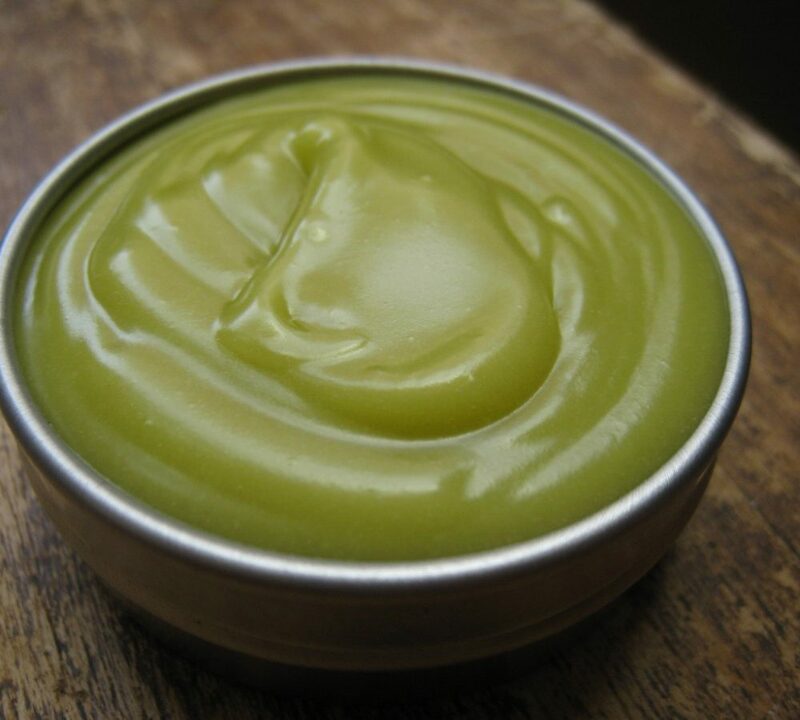 I made this except I made it a lot thicker, and put it into a few lip balm tubes, as I am a right arm amputee. Also, I am a burn survivor with 38% injury to my upper right torso. Works incredible on my skin grafts as the skin is incredibly delicate but always so itchy. Instead of a stick blender I used a 2 cup mini food processor. It’s easier for me to handle. 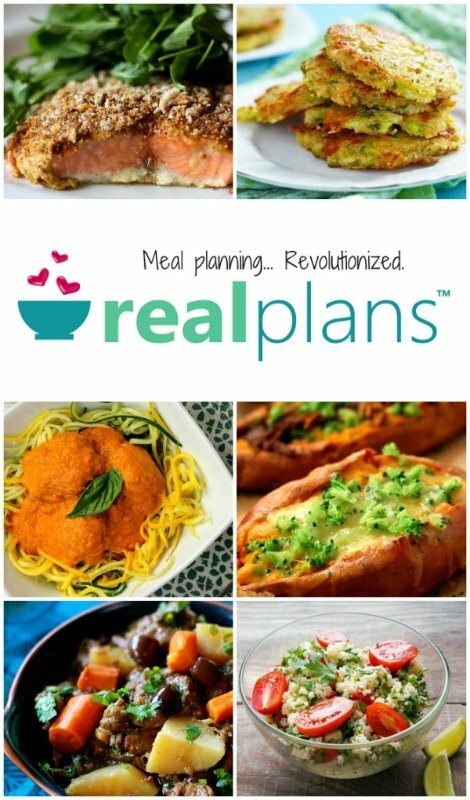 Love your recipes and have been stocking up on supplies so I can make these projects in the late fall and winter! It’s worth noting that another absolutely unbelievably good burn remedy is “Tamanu Oil.” I scalded my entire hand recently with fresh-off-the-pot boiled water, but after I immediately applied tamanu oil and then raw honey over the top, the burn receded into nothing by the next day. Look into it, trust me! Great post! I am always looking for natural ointments. I also use 100% Lavender Essential Oils for burns and wounds, I bet adding Lavender Oil would be great in this ointment. I am a really big fan of raw honey. Would this work as an effective facial mask for acne? Is this good for eczema? Just thinking that MANUKA honey would be great for this and also that Comfrey is a fabulous plant, the Old English Name is knitbone, it was used as a poultice for just about every wound but excellent for bone healing , hence the name, it is sooo good to infuse the fresh leaves in a good quality oil , helps with the pain of arthritis etc. The plant is quite invasive so need to keep it under control! makes a fantastic fertiliser , soak leaves in tub(with lid, ‘cos it STINKS) leave for at least two weeks then water on anything, stand back and watch it grow! Was just researching and found where someone in a swap found mold and fungus growing in a lotion enriched with honey. I thought honey would be antibacterial and antifungal. Do you have a preservative for this, or is there a way test it to be sure it’s safe? Since it can’t always been seen or smelled, I’d hate to put something with crawlies or fungus in an open wound. 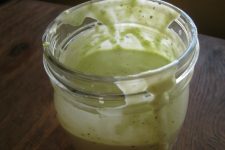 I make an herbal salve that’s great for burns and might be easier to obtain the ingredients. I use comfrey, plantain, yarrow, and st. john’s wort dried leaves. Never measured exactly but more of the first 3 and less of the latter. I put into a 1 cup measure cup and pack down. In the top of a double boiler put the herbs and fill to just cover with olive oil. Cover and simmer the water in the bottom for 3 hrs. Stir occassionally and it should always smell ‘green’. If it smells burnt then you’ll have to start over. After 3 hrs. strain using old t-shirt or coffeee filters. 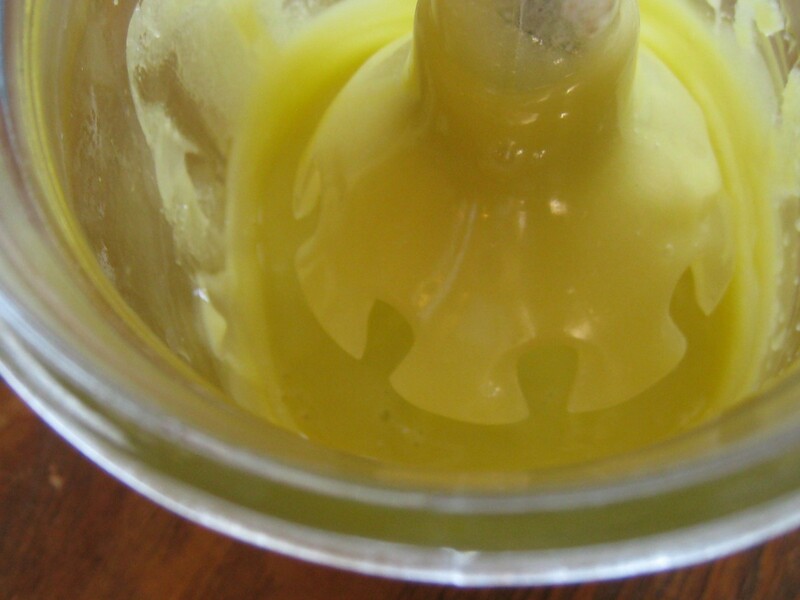 If you have 1 cup infused oil use 1/4 cup beeswax to make the salve. After infusing tea tree oil and helichrsum (pain-a-way oil) can be added before the beeswax. Amounts can be at your discretion. For 1 cup oil I’d add 25 drops of each maybe. I’m a wing it person. But this works great for all types of wounds and all items can be gathered from back yards/gardens. I have used it on minor burns covered with a bandaid and by the next day it’s pretty well healed. Had someone use it that burned herself fairly bad cooking on a woodstove and said by morning it didn’t hurt at all. I use the leaves not roots but they can be used for comfrey. Can be used on pets as there’s nothing that will hurt them. If you make it for pest maybe use less of the essential oils. Have been doing this for about 12 yrs. to replace the yucky neosporin. Hope this helps someone. Also for a real easy diaper rash infuse calendual flower petals in olive oil suing the same method I mentioned and add beeswax same proportions. Has been used to practically clear up diaper rash on a baby who only got changed twice/day. No, not mine or family. A family who didn’t deserve children, that’s the nicest I cna say. Herbal remedies are great. Can you add aloe? That is what we use on burns at my house. It absolutely rocks for a burn treatment. And it grows here in the Houston area with no real care in the yard. Wow, this looks like a great recipe! What is the shelf life for it? Do you think honey makes the shelf life shorter or not? Thanks! It is refreshing to see products that adhere to the old reliable ways of the past, It reminds me when I was a small child at my grandmothers home. I would help her make handmade quilts, can fruits and vegatables and ointments from natural ingredients, she’s gone now, and I can’t go back and learn all that she knew. Iwish I had kept up with those ways today because they worked. Can this be safely used on pets? I have a foster dog that has wounds that just won’t heal. I’ve tried changing his food, adding in fresh chicken, rice & eggs, topically applying coconut oil, diluted betadine, diluted peroxide, diluted grapefruit seed extract, colloidal silver, Dr prescribed antibiotics….ugh. Nothing is working. It’s heartbreaking and very frustrating. As far as I understand, using things like peroxide slows healing because it doesn’t really allow the platelets of blood to formulate. We have dabbed pure organic honey straight onto skin wounds and it works very well to clear the skin and apparently to allow healing. I just think it is very important to note that, although the other uses are good, it is essential that someone with 2ND-DEGREE BURNS seek EMERGENCY MEDICAL ATTENTION. Seriously, no matter how much you might be against conventional medicine, or how desperate you are to sort it out yourself and stay at home, it really isn’t worth it. I’m so glad I found this. Recently I’ve been finding that, after 2-3 days of use, polysporin makes me break out into a bad and itchy rash. So I’ve been looking for an alternative since I’ve been getting laser tattoo removal and need something to heal and moisturize the burns. I have most of these ingredients, saved for the herbs, so I’m looking forward to picking these up tomorrow and trying it out! Thank you for posting this!! !